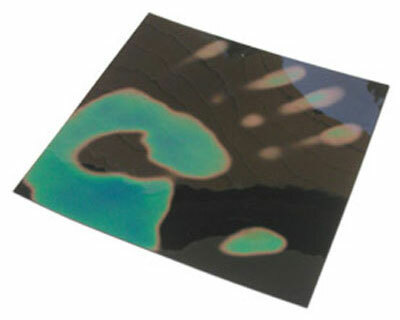 Heat reactive materials change state, shape and/or color when exposed to temperatures above ambient. Naturally, many materials change shape, eg. melt, at high temperatures. What’s special about some of them is that their state, shape and/or color can be altered at relatively low temperatures (provided through hot water, body heat, hair dryers, ambient heaters, ovens, or just a hot summer day), making them easy to use and suitable for DIY projects. In this post I’ll go over thermochromic pigments and a few materials they have been incorporated into, namely paint, fabric, film and glass. 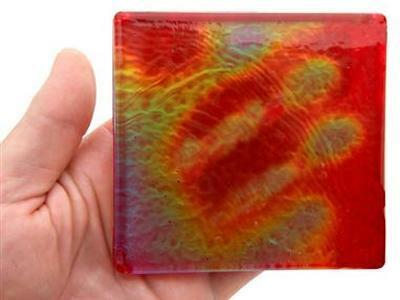 Most thermochromic materials are based on liquid crystal technology. At specific temperatures the liquid crystals re-orientate to produce an apparent change of colour. The liquid crystal material itself is micro-encapsulated – i.e., contained within microscopic spherical capsules typically just 10 microns in diameter. Billions of these capsules are mixed with a suitable base to make thermochromic printing ink or, for example, plastics destined for injection molding. These pigments can be mixed with an acrylic base or screen printing ink. At room temperature the pigment appears in its original color, but at temperatures between 27Â° and 30Â°C (80Â° to 86Â°F) this color disappears, eg, if a black pigment is applied to a white surface, the surface turns from black to white at the change-over temperature. When mixed with an acrylic base each pigment will turn instead into the color of the acrylic base or color blender, eg., if a blue pigment is mixed with a yellow acrylic base the resulting color will be green, but at the change-over temperature the blue will disappear and the green will turn into yellow. The ratio of acrylic base to coloring pigment depends entirely on the application and density of color required. For a detailed explanation of the functioning and applications of thermochromic pigments see the TEP Smart Colors info sheet (PDF) and this little demo animation. The textured glass surface layer protects and highlights the color-change film on the tile. 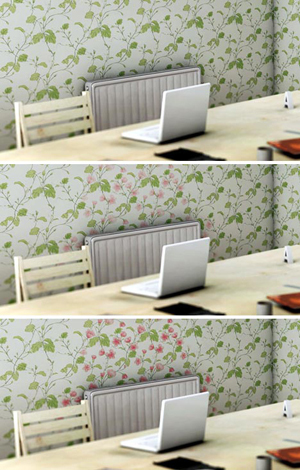 The base color of the tile can match almost any color, and the temperature change point can be fit to the userâ€™s environment and requirements. The dynamic color change begins at the selected activation temperature and shimmers through three phases, one with each 6â€“10Â° rise in temperature. Once the temperature peak is passed, the base color returns and remains the same until the temperature drops. 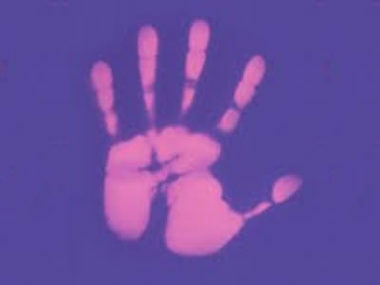 Thermochromic Film has adhesive on one side and thermochromic ink on the other. The film is normally black but changes to bright green/blue at temperatures between 29.4 and 33Â°C (84Âº – 91Âº F). Due to its low change-over temperatures, touching a piece of thermochromic film for a few seconds will cause the contact area to change color – it can also be used with nichrome or any other heat source. The video below shows a series of experiments with thermochromic and photochromic pigments by Francisco Mesquita from the Minho University. For more information on Francisco’s experiments, check out this report (pdf). If you’d like to contribute content or corrections regarding thermochromic materials, please use the comment form below. Hi Jagadish. Open Materials is an educational site, we don’t sell any products, only share information. To order a sample you should contact the supplier directly. after much searching, i have found that most thermochromic paints available are only the kind that shift from a color to clear. i can’t find the kind that shifts through the spectrum of colors..however you can find it in sheet form, but that’s not very helpful. : ( it’s like a big secret or something! Hi Ashley. That’s correct, the two commercially available products are either paint/pigments which turn from a given color to clear, or thermochromic film which goes through a range of colors depending on temperature. Unfortunately I also haven’t be able to find the materials or production techniques to make that film. We sell all kinds of thermo pigments/paints. All temp ranges and colors. Check out http://www.nordiccarpaint.com for more info! Hey I have a school project and I have an idea of what I want to do (a coat that responds to the wether for example if it’s hot the coat will get smaller and lighter and visa versa) but I need to know a material that changes in that way is there one? Hi Holly. The only material I can think of that would do something like that is shape memory alloy (SMA) – a think metal wire that shrinks a little bit when heated. The two issues with this material are: 1) the heat is usually provided by an electric current and ambient heat might not be enough to make it change shape; 2) SMAs shrink very little (only 3 to 5% of the length of the wire), but there are ways to amplify this movement – though I’m not sure they’d be enough to make a *very* perceptible change in the size of the coat. I have looked dthrough the vendors and noticed that most things (like the cloth) go from red or pink to white is is difficult to go from white to red? Hi Wes. That’s a great question! Thermochromic pigments go from one color to translucent – if the pigment is red and it’s painted on a white background, it’ll change from red to whitish. I’ve also been looking for thermochromic pigments or paint that go from white to translucent and was unable to find any. I don’t know the reason. Hey guys if you still looking for smart inks try this – https://www.sfxc.co.uk/ so far it is the best store i could find. i am looking for information about thermochromic materials. I want to know that can i use that material in disposible glasses? In which if i pour cold liquid in that glass it changes its colour. I want to know which type of materila are used in this process. Hope the have a prompt reply.